Lookout for our latest range of delicious products! MILK, YOGHURT, BUTTERMILK. All made using milk from our farm. We are currently delivering to shops in OFFALY, DUBLIN every Wednesday. See here for a list our stockists. And please contact us if you have any suggestions or feedback on our products. Mossfield Organic Farm is located six miles from Birr in County Offaly at the foot of the Sleive Bloom Mountains. The majority of the farm consists of limestone pasture which produces lush grass interwoven with wild herbs and clover, this provides ideal grazing for the herd of eighty cows. 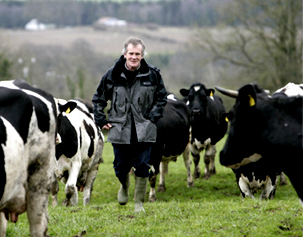 Ralph Haslam has being farming at Mossfield since 1970 and in 1999 converted to organic farming. The conversion to organic farming practices was the first step of many that has resulted in the on farm production of a variety of products made from our dairy herds milk. Our products are made using the freshest possible milk with the least amount of processing possible. Our bottled milk is not homogenised or standardised so you get to enjoy milk in its natural form with all the cream, our natural yoghurt has no milk powders added and is not homogenised.